It’s hard to find a place in the world where pets would be so much surrounded with attention and care as they are in the UK. This is the feature of British mentality—not even children but pets are in center of everyone’s attention not only in financial aspect but also in sense of care. Describing the dogs preferred throughout the country in 2017-2018, would be fair to mention Labrador as the most popular breed followed by Cocker spaniel, English Springer spaniel and German Shepherd. It’s hard to say whether there is or not sort of a “fashion” on dog breeds as the choice itself is determined first of all by the lifestyle of the future owner, his temperament, place of living, the amount of time he has for being with his pet and taking care of it. Consequently, people pay attention to the size, wool length, also temperament and needs of certain breeds to choose from. So, Labradors take the leading position due to their being characterized as friendly, intelligent and easily trained, good guides. Cocker spaniels are famous for their cheerful mood and tendency to be involved into any moving activities. English Springer spaniels as cockers are initially gun dogs happy to be in motion accompanying their owner. German Shepherds are famous for their loyalty, protectiveness and being faithful companions—not surprisingly the breed is used as military in the Police. Cavalier King Charles spaniels continue the list of popular breeds in the UK due to those being charming in appearance and popular since the time of King Charles II. 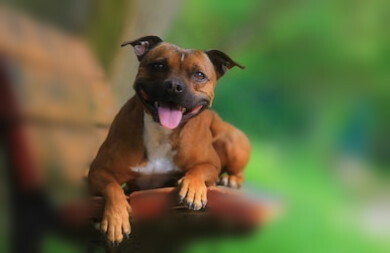 Staffordshire Bull Terriers are the most popular in London and urban places. By mistake they seem aggressive to public due to not always proper care of their owners. But if to educate them correctly—they show themselves as affectionate and loyal and compassionate mates! Golden retrievers at times viewed as Labradors by mistake are famous for their being excellent detectives due to their ability to hear and orientate well on a place. If the owner of a Golden Retriever prefers water activities—the dog would be happy to accompany! The British interested in a strong, serious, purposeful family member, stop their choice at Border Terriers—dogs of great stamina due to their initial hunting matter. Boxers are loved by families that prefer spending their time in an active way normally outdoors. West Highland White Terrier known as “Westie” originated from Scotland is the perfect choice for those who live in smaller properties, though good to remember that these dogs require much motion outdoors. To sum all up, would be fair to notice that “fashion” on some breeds descend from those the celebrities possess like bald Mexican Hairless or Chinese crested or Pharaoh Hound and Cirneco Dell’Etna with oversized ears—regarded as ugly by many people.